The Berlin National Library (Staatsbibliothek zu Berlin) has posted online the Erfurt Manuscript of the Tosefta (Tosefta Ms Erfurt 12 – Staatsbibliothek (Preussischer Kulturbesitz) Or. fol. 1220) in high resolution full color. The Erfurt Manuscript is the oldest extant manuscript of the Tosefta, although it is not complete. According to Saul Lieberman, in his introduction to his edition of the Tosefta, it was written sometime during the 12th century in Germany, by an Ashkenazi scribe. 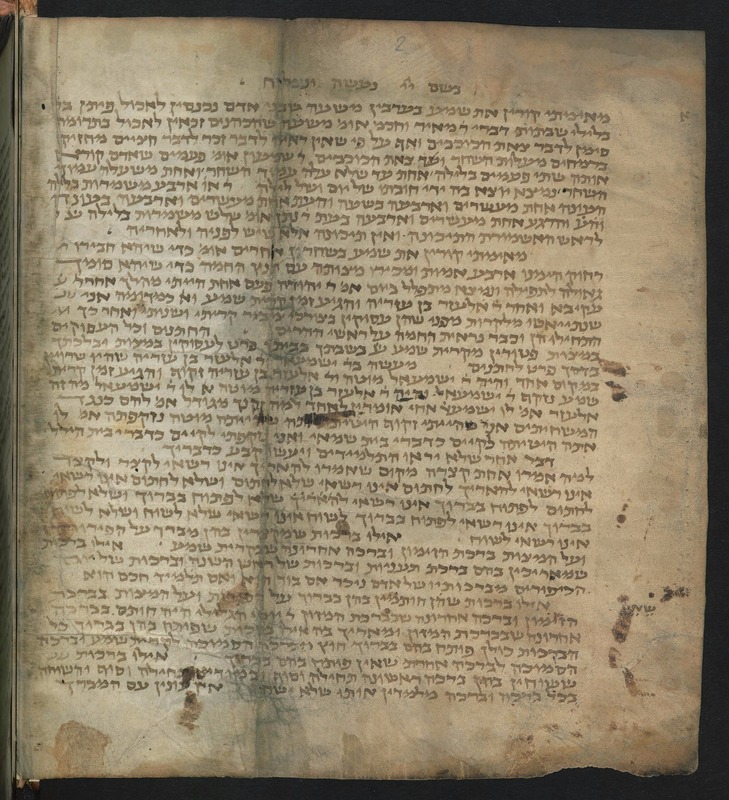 The Erfurt Manuscript contains the first four Sedarim (Zerayim, Moed, Nashim and Nezikin) of the Tosefta and the first four and a half chapters of Masechta Zevachim. After that the manuscript stops implying that it was never finished by the original scribe. It contains 226 folios, 222 of which is the Tosefta and the last 4 is some other material. The history of the Erfurt manuscript is partially written on its last page and partially in the Memorial Book of the City of Erfurt. The gist of the receipt written on the last page of the manuscript is as follows. In the Jewish year 5020 (1260) it was owned by Rav Yakov Bar Simcha. This Rav Yakov owed some money to Rav Elazar Bar Yitzchak Halevi. A third of this manuscript, together with another book was given to a third party, Rav Yehudah Bar Shneur, to be held as collateral until Rav Yakov paid his debt to Rav Elazar. The story continues in the Memorial Book of the city of Erfurt, Germany. In the year 1362, the council of the city of Erfurt sold a bunch of Jewish manuscripts for 34 marks. Prior to that these manuscripts laid around for many years in the building of the city council in Erfurt, including during the Jewish pogroms in 1349 which followed the epidemic of Black Plague. In 1879, 16 of these manuscripts were found in the Erfurt Evangelical Church Library and among them was the manuscript of the Tosefta, labeled N.11V.12. In 1879 this collection of manuscripts was transferred to the German National Library in Berlin, where they remain today. The name of the Tosefta manuscript remains to be the Erfurt Manuscript, based on the city where it was originally found. The manuscript is labeled in the Berlin National Library as Staatsbibliothek (Preussischer Kulturbesitz) Or. fol. 1220. The manuscript contains blood stains on it, which suggests that one of its owners was murdered or at least very hurt during some violent encounter, at which point the manuscript was taken away from him. I would suggest that it is very possible that this happened during one of Jewish pogroms in Germany, which is how the manuscript made its way to the Erfurt Evangelical Church, where the manuscripts stolen from Jews were collected. But this is only a theory. I think this is related to the timing of the manuscript.